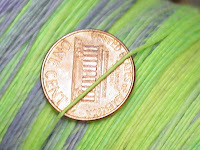 Here are the photos of the recreated colorway below spun and resting on the bobbin. I have to get a ball winder tomorrow so that I can ply it back onto itself. I have a nostepinde but this is several yards of "skinny" yarn. That could produce all kinds of problems with tangling and I don't want to lose any yardage. 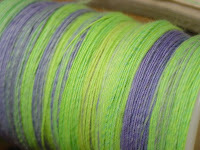 The process of spinning is very relaxing. It really lets the creativity flow.